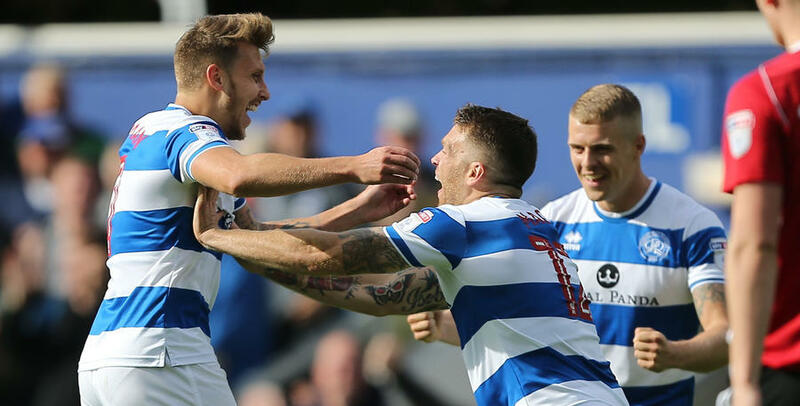 A nervy final few minutes but QPR get it over the line as goals from Jamie Mackie and Luke Freeman are enough to secure victory despite a late goal from Ipswich sub Bersant Celina setting up a nervy ending. Five minutes of added time at the end of the match. Luke Freeman is shown a yellow card for a foul. Ipswich Town pull a goal back 90 seconds before the 90th minute as sub Bersant Celina beats Smithies from the edge of the box. Massimo Luongo shows a nice turn of pace to surge forward before the Australian international shoots inches wide of the upright from the edge of the box. So nearly three for QPR as Matt Smith takes advantage with his first touch after the keeper fails to keep hold of a cross and the R's striker rattles the woodwork. Another change for QPR as Jamie Mackie makes way for Kazenga LuaLua and Conor Washington for Matt Smith for the final 10 or so minutes. So close to a debut goal for Wheeler as Freeman's corner isn't cleared and the former Exeter winger, with his first touch, fires wide of the far post from 14-yards. Come on! Goal scorers Jamie Mackie and Luke Freeman are all smiles. Off goes Pawel Wszolek to a standing ovation as David Wheeler comes on to make his QPR debut. Grant Ward off, Bersant Celina on. No idea what happened by QPR are prevented from turning in Freeman's corner following a goal mouth scramble. Another chance for QPR as Washington pulls Baptiste's ball out of the sky before fashioning a volley on the edge of the area but the keeper saves. Mass Luongo lets rip from 30-yards and it forces a superb save to deny QPR a third goal. Luke Freeman puts QPR 2-0 in front. What a start to the second half from QPR as Luke Freeman toe pokes (that's doing it a disservice) it past the Ipswich keeper from the edge of the area. 2-0 to QPR. We're back underway in W12 as Ipswich Town get the match started again. Come on you R's! Both sides are back out for the second half here at Loftus Road. Second 45 minutes coming up. Rangers lead at the break after Jamie Mackie's 43rd minute goal and it is just about what QPR deserve after enjoying the majority of the pressure. There will be one minute of time added on. QPR are in front just before the break as Pawel Wszolek pulls the ball across the 18-yard box and Mackie is on hand to guide it into the bottom corner with a lovely finish from 12-yards. Jamie Mackie drags the ball wide of the post from distance after good defending from Alex Baptiste at the other end to recover. Josh Scowen with a cross come shot and the keeper pushes over for a corner. Flynn Downes is booked for Ipswich after a foul on Jamie Mackie. Freeman takes aim from just inside the Ipswich penalty area and a strong save is required from Town keeper Bartosz Bialkowski to push it away. Ipswich with a chance as the ball is hung up for McGoldrick but his header is weak and Smithies gathers. Nedum Onuoha on his 200th appearance for the R's. After the lively first 10 minutes it's been a bit quieter since for both sides. Still goalless in W12. Conor Washington wins an early aerial battle for QPR. What a chance, what a chance! Wszolek whips the ball into the box but Baptiste can't quite get on the end of it from close range before Freeman forces a save from the left. Good start from QPR. Great play down the right-hand side from QPR as Mass backheels to Wszolek and the winger picks out Washington with his head but the R's forward nods wide. QPR are the first to test the goal as Conor Washington shoots on his weaker left foot from the edge of the area but it's easy for the Ipswich keeper. Here we go as Luke Freeman gets us started in W12. The final preparations are over and it's just under 10 minutes until kick-off in W12. QPR boss Ian Holloway has made three changes to the side that lost 2-1 at Cardiff City before the international break. In come Alex Baptiste, Jack Robinson and Jame Mackie for Darnell Furlong, Steven Caulker and Matt Smith. Meanwhile, new signings David Wheeler and Brighton Osayi-Samuel are named on the bench. QPR's Jamie Mackie all smiles ahead of today's match against Ipswich Town. Will the attacker start today? That's my Saturday matches #ParkersPredictions done. I'm off to watch @QPRFC take on @Official_ITFC and for those of you asking 2-1 Rangers! 🎥 R's captain Nedum Onuoha is set for his 2️⃣0️⃣0️⃣th #QPR appearance today. Today is more than a match of football against Ipswich Town. Today we celebrate the greatest venue in the beautiful game as QPR mark the 100th anniversary of our time at Loftus Road. Of course, there's no better way to do that than with three points and we will be on hand to guide you through the day here on the Matchday Centre.